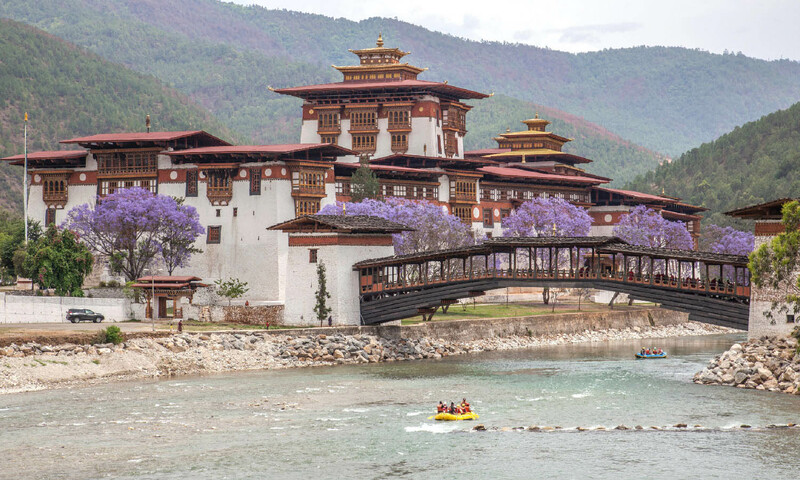 This itinerary includes trips to Bhutan's must-see attractions and has the perfect dash of adventure for beginners as well as seasoned adventurers. In between time spent at the major cities of Paro and Thimphu, visits to remote mountain villages and farmhouses, ancient fortresses, far-flung monasteries and countless chortens and ancient Buddhist sites with fluttering prayer flags, you will enjoy the thrill and fun of rafting on the country’s most beautiful and scenic rivers. Stay at the most luxurious Himalayan resorts and you truly have an almost perfect itinerary. All that is now missing is you. Enjoy fun-filled rafting and kayaking excursions. Go on farm visits and enjoy brisk mountain hikes. See ancient fortresses and temples. Enjoy luxury stays at locations offering unbeatable Himalayan mountain views. Visit the spectacular Tiger’s Nest monastery, Bhutan’s most iconic site. The thrill of rafting in Bhutan can’t be put into words. 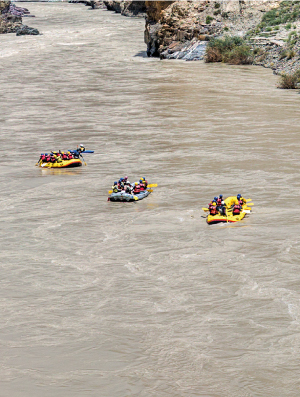 A couple of major highlights are the exhilarating rafting trips on the Paro Chhu and the Mo Chhu (Mother River). There are delightful options for beginners and jaded veterans alike. Fly by Druk Air to Paro. On clear days, this flight will give you breathtaking views of the Himalayan Mountains including Mt. Everest, Jichu Drak and Jumolhari in Bhutan. You will land in the beautiful valley of Paro, located at an elevation of 7,400 ft. At Paro International Airport, you will be received by our representative. Take a short drive to your hotel and check-in. Spend the afternoon acclimatizing and sightseeing. 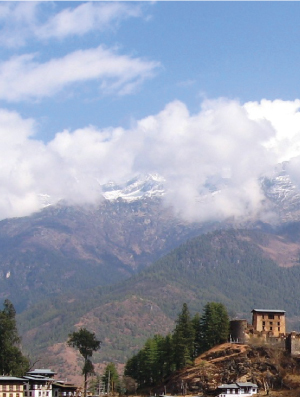 Paro is indescribably picturesque and you will get the entire day to relax and enjoy here. Overnight in Paro. After breakfast, visit the National Museum (Ta-Dzong), earlier a watchtower for the Rinpung Paro Dzong. It was converted into the National Museum in 1968 and stands on a strategic site atop a hill overlooking the Paro valley. 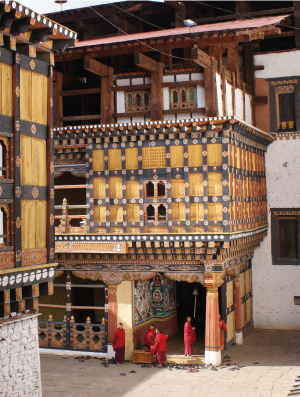 On your way back, visit the Paro Rinpung Dzong. Dzong means fortress and the country has about 20 of them. These were largely built in early 17th century. Dzongs serve as the base of the district administration and are also used as monastic schools. In line with age-old traditions, these huge Dzongs are equally shared. In the past, the Dzongs were used for repulsing attackers from Mongol and Tibet. A leisurely stroll on the walled flat stone pavements will take you to a grand old wooden bridge with shingle roof. The two entrances have a guardhouse each. In the evening, enjoy a stroll through the picturesque locales of Paro town. Overnight in Paro. After breakfast, you will spend some delightful hours rafting on the waters of the Paro Chhu. There will be a halt at a centuries-old iron bridge built by a Tibetan monk across the River Paro. While it was restored in 2005, the original construction is credited to Thangtong Gyalpo, a celebrated historical Tibetan architect. In the afternoon, you will drive to Thimphu, the capital of Bhutan. The drive will take around an hour’s time and finally you will check in to your hotel. Today, you will also visit one of the world’s largest sitting Buddhas. Overnight in Thimphu. Situated at an altitude of about 7,500 feet above sea level, Thimphu has been Bhutan’s capital since 1961. The city has a sizeable population but is remarkably traffic free and it’s a pleasure to explore Thimphu on foot or by bicycle. Start your sightseeing with a trip to the National Memorial Chorten. It’s a monument to world peace and also a memorial to His Majesty Jigme Dorji Wangchuck, the third king. The structure was envisaged by him. The paintings and statues here shed a lot of light on Buddhism. Next, explore the huge collection of Buddhist texts and manuscripts at the National Library. Some of these are several hundred years old. There are modern academic books as well, largely dealing with Himalayan culture and religion. Play connoisseur at the Institute for Zorig Chusum (commonly known as the Painting School). It’s full of works by students who have undergone a six-year course on the 13 traditional arts and crafts of Bhutan. At the National Institute of Traditional Medicine, you will soak in some priceless ancient wisdom. Here, you will get to chat with a renowned traditional healer. The last stop will be at the Folk Heritage and National Textile museums. At both these places, you will gain some fascinating insights into Bhutan’s material culture and way of life. The Handicrafts Emporium is a government-run enterprise and boasts a huge collection of exquisite hand-woven textiles and other craft products. It also houses a small collection of books on Bhutan, Buddhism and Himalayan culture. The evening is at leisure. Overnight in Thimphu. Start early in the morning and drive to Dochu La Pass (10,300 feet) and further onto the Punakha Valley. There will be stops at scenic locations on the way. The drive takes approximately 3 hours. At Dochu La Pass, stop to admire the views over a hot cup of tea. Dochu La is marked by a large array of prayer flags and a rhododendron forest surrounding 108 chortens or stupas. The chortens were built in 2005 to commemorate the ones who lost their lives in the struggle between Bhutanese soldiers and Indian rebels. 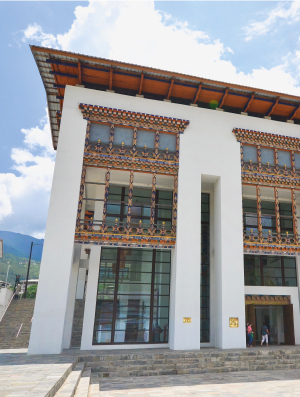 In Punakha, start your sightseeing tour with a trip to the grand Punakha Dzong, one of the most impressive dzongs in the country. It’s a wonderful place for photography, especially during springs, when the purple Jacaranda flowers strike a sharp contrast against the white walls of the dzong. A major highlight here is the six-story high utse (central tower). For lunch, visit a farmhouse and join a family for a cooking demonstration and tasting. Enjoy a cup of fresh yak butter tea or home-brewed liquor – fiery arak or sweet sinchang. Help them make ema datsi (cheese chili), buckwheat noodles and pancakes with red rice, served along with hot chili curries. Post lunch, hike to Chimi Lakhang, a temple dedicated to the “Divine Madman”, an eccentric Bhutanese monk who lived in the 15th century. He is said to have tamed a female demon with his "thunderbolt." Skillfully rendered phalluses adorn the walls of Bhutanese temples and homes to symbolize fertility blessings. Return to your hotel by evening. Overnight in Punakha. In the morning, you will hike past rice fields to a remote but lovely chorten overlooking the River Mo Chuu. It is off the beaten track and was built to promote world peace, stability and harmony. 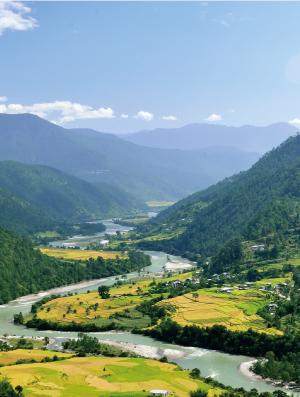 In the afternoon, go rafting on the River Mo Chhu (Mother River) down to the Punakha Dzong and reach the confluence of Mo Chhu with the Pho Chhu (Father River). Return to your hotel by evening. Overnight in Punakha. Watch a spectacular sunrise from the Khamsum Chorten. The Khamsum Yuelley Namgyel Chorten is an approximately 100-foot tall stupa and has three levels. Dedicated to the fifth king of Bhutan, the Chorten was built to thwart negative energy and bring in peace, stability and harmony in an ever-changing world. This afternoon, you will check-out and drive to Paro. The driving time is approximately 4 hours and in Paro you will transfer directly to your hotel for check in. Tonight enjoy a farewell dinner at your lovely hotel. Overnight in Paro. All departure formalities will be completed in advance and you will be assisted by your guide. After an early breakfast at the hotel, drive to the Paro Airport to catch your flight back home.